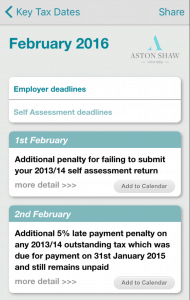 Aston Shaw’s Tax Calculator App is available to download for FREE from the Apple iStore and Google play! This innovative app is jam-packed with useful features for any business owner. We understand that many of our clients are smartphone users, so keeping this in mind, we decided to create an app that will be both practical and useful. Many of our clients have said they have found the app to be an essential tool in the day-to-day running of their business. Of course, you don’t have to be a client to benefit from the features this app has to offer. This app will not only save you money, but time. Before installing this app, you would have had to trawl through page upon page on the internet to find what you’re looking for, this app has everything you could possibly want to know about current taxation all in one place, your smartphone. 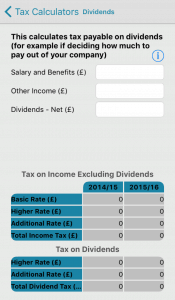 Tax Calculators – Using the calculator, you can work out how much tax is payable on a number of things, such as corporation tax, dividends, income tax and many, many more . 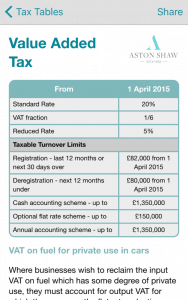 Hot Topics – News, updates and changes in tax legislation that may affect you. Best of all, this app is completely free. To download, please click one of the two links below, depending on your device.